And on Monday the Orange County Sheriffs Department announced it will publicly post inmates release dates in order to assist ICE agents. Reporter: Does that mean a lawsuit of the sheriffs department or the arrest of the sheriff? Somewhere in California is the next Fort Sumter. When I saw the results from this Bezerkly poll on the subject, I knew that day would be coming very fast. The OC Sheriff is right where he needs to be. The AG is just another Marxist swamp monster about to be slayed. I call obstruction of justice. Becerra is a Hispanic supremacist. But federal law isn't federal law? Isn't it the job of ICE to enforce federal law? OC Sheriff may be the next CA Governor even if he has to run his campaign from jail. If the sheriff plays this right, he may parley this bit of (we’ll call it civil disobedience) to a higher state office, perhaps governor. At some point there may come a political tipping point where liberalism is kicked out. Of course, the longer the current situation drags on the more “conservative” votes will move away. This moves, or perhaps negates, the tipping point. How this eventually plays out will very much depend on timing and circumstances. I was watching Fox yesterday, I (think) maybe the OC Sheriff might be a woman. I don’t know that for a fact (just tried to look it up, but it was a bit confusing) but I believe it was a woman being interviewed. Sometimes men from California look like chicks. Just sayin’. Becerra should be in the custody of Federal Marshalls at this moment, awaiting trial for treason on behalf of Mexico. The OC sherif is a woman! becerra is threatening a woman! Trump needs to “threaten” to arrest Moonbeam. Becerra needs to be on the business end of a marine bayonet. California is in a state of rebellion and Federal troops should start arresting principal state officials. NO threats, just do it. The marxists are using the hispanic and black and muslim populations to destroy our government. Sometimes men from California look like chicks. Just sayin. Those arent from The Golden State - they moved here from states like whatcha got in the East and places like Illinois and Florida. 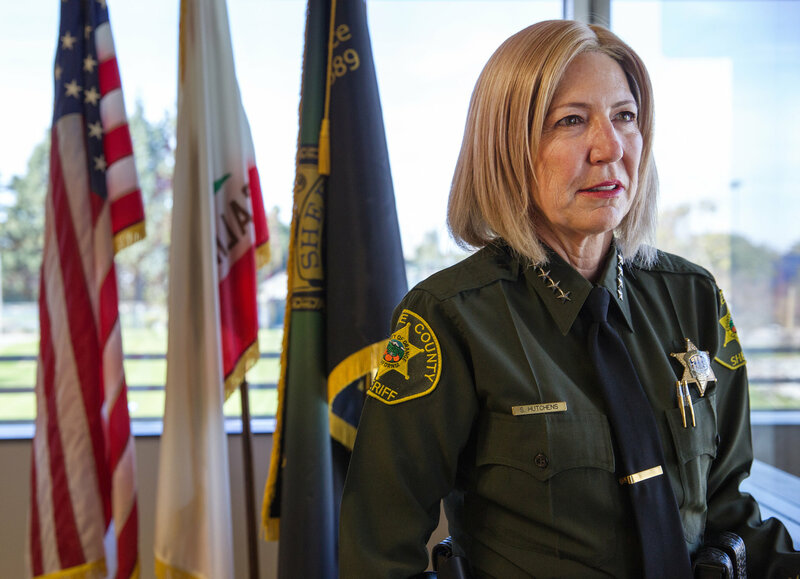 Sandra Hutchens is the current Sheriff-Coroner of Orange County, California. She was appointed to the position on June 10, 2008, replacing acting sheriff Jack Anderson, who had led the department since the January 14, 2008 resignation of former sheriff Mike Carona. Prior to her appointment, she was retired from the position of division chief within the Los Angeles County Sheriff's Department. In the June 2010 California Primary Election, she won a majority of the votes and is currently serving her first full term as Sheriff. Every time the elections roll around, the probability of California natively going Red rises, as the locals get sicker and sicker of the mess. And Jerry Brown and the Dems just haul more illegals in to stuff the vote. Thats all. I lived for a long time in Orange Country California. I was (really) pleased to see the interview yesterday. Bacerra needs to be careful. He could make something of a hero, of this brave lady. In my opinion.